With a stay at The Westin Puntacana Resort & Club in Punta Cana, you'll be on the waterfront, within a 10-minute drive of Punta Cana Beach and La Cana Golf Course. This 4.5-star resort is 11.6 mi (18.7 km) from Bavaro Beach and 2.7 mi (4.4 km) from Corales Golf Course. Make yourself at home in one of the 200 air-conditioned rooms featuring minibars and LCD televisions. Your pillowtop bed comes with down comforters and Egyptian cotton sheets, and all rooms are furnished with sofa beds. Rooms have private balconies. Wired and wireless Internet access is available (surcharge). Private bathrooms with shower/tub combinations feature rainfall showerheads and complimentary toiletries. Pamper yourself with a visit to the spa, which offers massages, body treatments, and facials. While the golfer in the family is out on the course, you can enjoy above-par recreational amenities such as outdoor tennis courts and an outdoor pool. 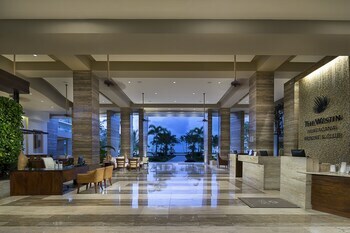 This resort also features wireless Internet access (surcharge), concierge services, and a hair salon. Enjoy international cuisine at Anani, one of the resort's 5 restaurants, or stay in and take advantage of the 24-hour room service. When you are in need of a refreshing drink, visit the poolside bar or one of 3 bars/lounges, or 2 beach bars. Buffet breakfasts are available daily from 6:30 AM to 11 AM for a fee. Featured amenities include a 24-hour front desk, luggage storage, and laundry facilities. Planning an event in Punta Cana? This resort has 3154 square feet (293 square meters) of space consisting of conference space and a meeting room. A roundtrip airport shuttle is provided for a surcharge (available 24 hours), and free self parking is available onsite.